THE HIGH COURT in Belfast has awarded the families of two men killed on Bloody Sunday £700,000 (€788,470) in damages. The family of 35-year-old father-of-eight Gerard McKinney were awarded £625,000, while the family of 20-year-old Michael McDaid received £75,000. 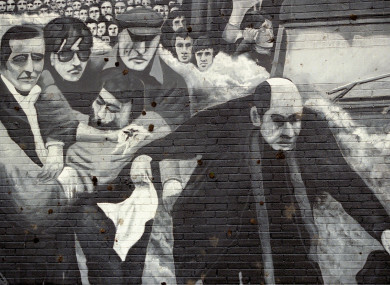 The pair were among 13 people who died after soldiers opened fire on crowds in the city of Derry on 30 January 1972. A 14th died later. Roughly 10,000 people had gathered in the Creggan area that morning to take part in a civil rights march before the soldiers opened fire. McKinney, an engineer, was shot dead at Abbey Park in Derry while McDaid was killed near a barricade on Rossville Street. After the Saville Inquiry exonerated all of those killed, acknowledging that none of them was posing a threat, then-Prime Minister David Cameron calling the shootings “both unjustified and unjustifiable” as he apologies in the House of Commons in June 2010. Following on from this, families of the victims launched court cases against the Ministry of Defence. In court today, Mr Justice Gerry McAlinden commended lawyers involved in the case for reaching the settlements “without the need for any distressing sensitive or distressing evidence to be given”, the BBC reported. A barrister for the Ministry of Defence told the court that similar agreements are expected to be reached with the families of other victims. Fearghal Shiels, of Madden and Finucane solicitors, said today: “This is a further vindication of their innocence and the families in bringing the proceedings. We also welcome the fact that this has been resolved without the need for Mr McKinney’s daughters to take the witness box. Last week, a man who was shot in the face as a 17-year-old schoolboy on Bloody Sunday was awarded nearly £200,000 and Shiels told BBC Radio Foyle the compensation in that case would act as a “catalyst” for future cases. Comments are closed due to other court cases pending in relation to this case. Email “Families of two men shot dead on Bloody Sunday awarded £700k”. Feedback on “Families of two men shot dead on Bloody Sunday awarded £700k”.